Join Mayor Andy Berke in the Get Fit Challenge and discover the unique opportunities Chattanooga has to offer by engaging in new fitness and outdoor activities. Will you join the Mayor and your community in exploring Chattanooga's great outdoors? Three new miles of the Tennessee Riverwalk connect downtown Chattanooga to St. Elmo. Check out the new trailhead, scenic views and artwork at Blue Goose Hollow - the newest entry to the Riverwalk - located where M.L. King Boulevard meets the Tennessee River. 10 Urban Outdoor Adventures: Pick up a Pocket Guide! The new compact guide includes 10 micro-adventures including running, cycling, picnicking, fitness training, walking, kayaking, paddle boarding, trail running, mountain biking, and rock climbing - all conveniently located within a 10-minute radius from downtown. 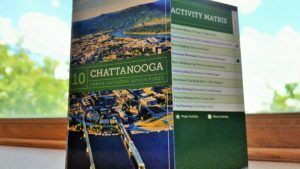 Pick up a guide today at Outdoor Chattanooga, City Hall, High Point Climbing, Rock/Creek or a local hotel. Take the Get Fit Challenge! Receive invites to new challenges, find opportunities to get fit with Mayor Berke and your neighbors, and access Chattanooga's outdoors. Want to invite Mayor Berke to your fitness event or outdoor adventure? Send us all the details in the "Comments" section below, and your event could be the next Get Fit Challenge. Text GETFIT to 97779 to join the Get Fit Challenge! Share how you and your friends Get Fit - use #CHAGetFit and tag Mayor Berke (@andyberke) in your posts on Twitter, Facebook & Instagram!